An old variety, grown since before 1847, but long since almost disappeared. We are very pleased to be able to offer this superb old variety that excels for dessert, pies and preserve use. 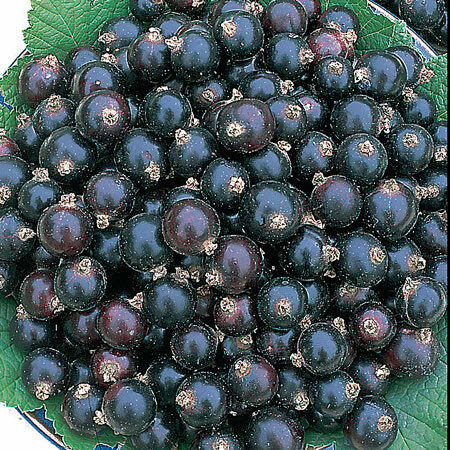 The bushes are medium sized and very erect with well spaced branches, and the fruits are normally produced on short trusses with very large sized berries of superb exhibition quality. A true Goliath among blackcurrants. Cropping mid-season, the fruits ripen evenly and hold on the bush well,. giving a good crop of very high quality. The flavour is quite superb. Sweet, luscious, thin skinned fruits that are always bound to give pleasure. Goliath is a very old variety and is thought to be synonymous with the even older varieties Victoria and Edina. After many years' searching, we finally located stock of this old variety in Europe and our propagations now enable us to offer this variety again. A superb variety for garden culture, and a must for the connoisseur. Grown from European certified stock. UK mainland delivery is charged at £8.95. Sending a tree through the post isn't easy, so our parcels are expertly packed to keep your goods in the best condition. There is no surcharge on the delivery of larger parcels/orders. Tree size as supplied varies but is usually between 3.5' - 4.5' on despatch. A few varieties might be slightly smaller, some a little bigger, of course it does vary but this is a good average. WE SUPPLY YOUNG TREES - and are proud to do so. Although we are sometimes requested to supply older/bigger trees, the percieved advantages are outwighed by disadvantages! Older trees take longer to establish and will fruit no more quickly. The young trees we send out grow away and establish so quickly and healthily & often yield within 1 season of planting. Our customers even report fruits the first year of planting! All professional fruit growers prefer to plant young trees rather than older. Our soft fruit bushes are usually 2 years old. Everything is stringently graded, grown on the nursery and well packed! No need to be in - You can request your parcel to be left in a safe place, or stipulate an alternative delivery address, at the checkout. Free 16 page booklet with every order dealing with all aspects of fruit growing. We have in place very rigorous standards for the health, providence and uniformity of all our fruiting plants & trees. Our Nursery and the stock we grow is inspected and passported for health regularly by DEFRA experts [formerly the Ministry of Agriculture] and we have in place our own stringent controls and inspection programmes to ensure our fruiting bushes and trees are the best, most disease free stocks available and truly beyond compare. We always propagate from certified stock where this exists and have the highest standards regarding providence and grading. If only the very best will do - as it should - then you can rely on a Chris Bowers fruiting plant to give the most exemplary results available. We firmly believe that only the very healthiest stock can and does produce vastly superior results - and it shows. We are proud of each & every plant & tree we despatch from our Nursery. If it fails to thrive or live up to your expectations we will replace or refund it. This is in addition to your statutory rights. We may rarely ask for details of care and cultivation given to it, or arrange for a return of the item for inspection, to assist in our own programme of improvement.